Provide comfort for the family of Dale Hunt with a meaningful gesture of sympathy. 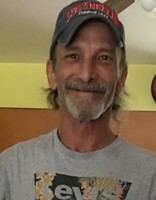 Dale Robert Hunt, Age 57 of Manistee died March 25, 2019 at his home. He was born on September 2, 1961 in Manistee the son of George H. & Nora J. (Swanson) Hunt. He was a 1981 graduate of Manistee High School. a 15 foot runabout across Lake Michigan to Kewaunee and back. To send flowers in memory of Dale Robert Hunt, please visit our Heartfelt Sympathies Store. Provide comfort for the family of Dale Robert Hunt by sending flowers. I will always remember Dale's smile. It seemed to always be on his face. I have a lot of good memories and will forever remember the motley crew of my cousin John, Harry Polen, and Nathan Beck (just to name a few). I am so sorry for your loss. Please know that I am praying for you all and send my condolences. Having grown up on Kott Rd., just down the street from Dale, I remember how much he liked to have fun on the school bus, and how he used to help us located Happy, our sheepdog, who had penchant for going on week-long jolly adventures to bum sandwiches from the school bus stop and Orchard Beach State Park. Dale had a kind heart, and was a good neighbor. We will miss him.